This morning, Hulu announced a new section called “Hulu Kids,” which, as the name implies, organizes all the kid-friendly content in one easy-to-access section within Hulu’s video library. The section is available online directly at Hulu.com/kids, and it can also be found in the “Kids” section of the “Browse” menu. Hulu Kids is only available for Hulu Plus subscribers, however, the announcement states. The move follows Netflix’s recent expansion of its own kid-friendly service, “Just for Kids,” which arrived on the iPad this October. Previously, Netflix’s Just for Kids had been available on the web and on gaming devices like the Xbox 360 and Wii, offering a section of content designed for kids 12 and under. In Hulu’s case, the Hulu Kids service is also kicking off with web support, as well as support for the PlayStation 3. And if you use a Blu-ray remote with the PS3, it will work with the Hulu app as well. 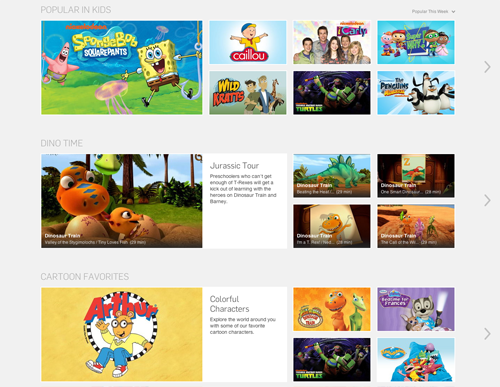 Unfortunately, no mention of Hulu Kids in the iOS application was announced, but it’s sure to be in the works.